We were delighted to welcome back Playpals today for their second TT@TT! Eleven musicians made up the November 2017 lineup of this U3A instrumental ensemble. The concert got off to a lively start with ‘Cabaret’ and ‘Wake up, Little Suzie’. 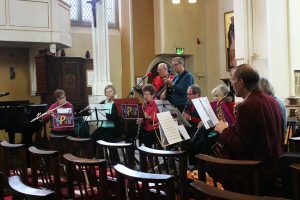 This versatile group also gave us duets and trios ranging from a guitar, bass and vocal version of ‘Twist and Shout’ to a clarinet and saxophone duet of Bach’s ‘Wish you were here’. With an interlude for ‘Happy Birthday’ for a group member, Playpals gave us Basin Street Blues, Every time we say goodbye’ and ‘Baby, it’s cold outside’. 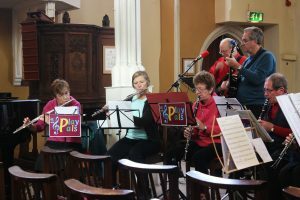 This was a most enjoyable concert and grateful thanks to Playpals for their great tunes and enthusiasm in their playing, which was much appreciated by all ages in the audience. We look forward to hearing Playpals again next year! 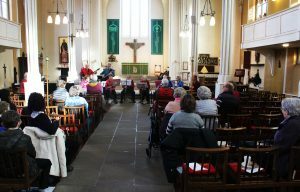 Thanks also to our kitchen crew and all who supported this event and gave donations of £27.91 for our organ maintenance fund.